Current as of January 2011. Originally published as part of our Theme Time Radio Hour "Frequently Asked Questions" document. A CD of the complete Baseball show was released in 2006 as part of a limited in-store promotion for Modern Times. The link above will take you to Amazon where various re-sellers offer the disc for prices ranging from the reasonable to the ridiculous. The disc can also be found on eBay. If packaging and "original condition" are important to you, you should make sure the packaging is the original cardboard sleeve (with the TTRH logo on the front and playlist on the back) and that the disc itself is not a CD-R copy but the original with silk-screened artwork. If you liked "Friends and Neighbors" (see below) chances are you'll love "Baseball," which features Your Host Bob Dylan performing Take Me Out to the Ball Game a capella among its other highlights. Another CD, featuring the complete "Friends and Neighbors" episode, is part of the "deluxe" Together Through Life package released in April 2009. The CD has everything that makes TTRH special and is the perfect starting point for introducing someone to the show: quirky music, interesting facts and trivia; two emails, wife-swapping and swinging, and Our Host launching into a blistering attack on modern country music. Who could ask for more? As with the "Baseball" disc, the original "Friends and Neighbors" CD is packaged in a cardboard sleeve displaying cover artwork and track listing. The CD also displays silk-screened artwork. In November 2009, Sony/Columbia offered a limited-edition 45 rpm vinyl record ("while supplies last") as a bonus to some purchasers of the "Christmas in the Heart" album. The B-side of the 45 is Our Host's reading of "Twas the Night Before Christmas" from the Theme Time Radio Hour Christmas Special. The A-side of the single also has an interesting Theme Time Radio Hour connection, Bob Dylan's cover of Brave Combo's version of "Must Be Santa," a song that was featured on the TTRH Christmas Special. Although no longer commercially available, the 45 is offered through various resellers on Amazon. Radio Bob and Radio Bob Another 17 Brillant Tracks...are two compilations originally included as promotional CDs in editions of Uncut magazine. Featuring music only from various episodes of TTRH, the CDs are probably only of interest to collectors wanting a complete TTRH-related collection. Both compilations can be found on Amazon and eBay. There are currently 11 different commercial CD compilations featuring music only from TTRH. These compilations do not include Dylan's commentary or other features that made the show unique. The tracks used on the compilations are not necessarily the ones used on the show. If you're interested in the folk, jazz, swing, rockabilly and country music played on TTRH, you might like these sets. If you're looking for TTRH shows, they're not for you. 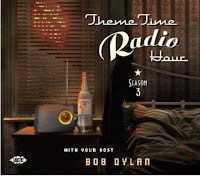 The Best of Bob Dylan's Theme Time Radio Hour Volume 1 and Volume 2 cover the show's first season. For reasons unknown, the U.S. Amazon store isn't carrying Volume 2, but it can be purchased at Amazon U.K. through the link above. Volume 1 can also be purchased at Amazon U.K. The Best Of The Second Series compiles music from the show's second season. It can also be purchased at Amazon U.K. Presumably the last of the Chrome Dreams TTRH issues, Bob Dylan's Theme Time Radio Hour - The Best Of The Third Series has been released in the U.K. and U.S.
All the above compilations are 2-CD sets of 52 tracks each. Four other "unauthorized" compilations come from the German Mischief Music label. Radio Radio is a 4-CD box set released in 2008 and covers music from TTRH's first season. 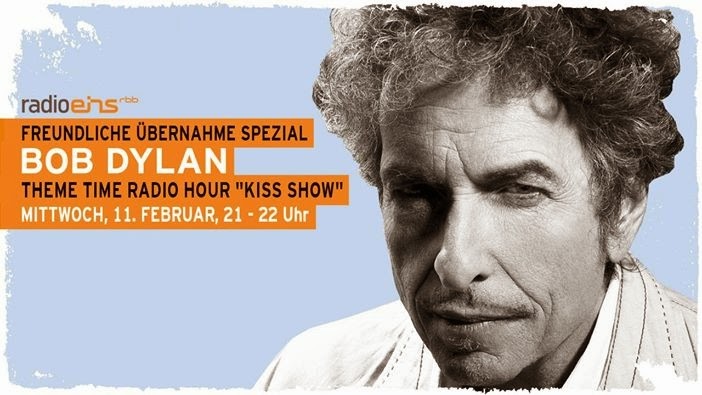 A second "Radio, Radio" compilation is also available, Bob Dylan Radio Radio Vol. 2. As with the first, "Vol. 2" is a 4-CD set with 112 tracks. "Vol.2" also focuses entirely on Season 1 of TTRH. A third 4-CD set, Bob Dylan Radio Radio Vol.3 appears to collect music played over Season 2 of TTRH with a total 108 tracks. A fourth compilation from Mischief Music was released in late 2010 and is available through Amazon U.K., "Radio Radio: Bob Dylan's Theme Time Radio Hour Volume 4." Personally, given that I haven't seen/heard it, I'd approach this one with a caveat audiens 'tude. A Dreamtime correspondent notes that at least one of the tracks was directly recorded from the radio show itself and several of the tunes fade out abruptly. Definitely a gray market entry in the TTRH field. The authorized Theme Time Radio Hour with Your Host Bob Dylan set was compiled by Ace Records U.K. under the supervision of TTRH producer Eddie Gorodetsky and Dylan factotum, Jeff Rosen. In September 2009 Ace released another 2-CD set, Theme Time Radio Hour Season 2. As the title implies, the compilation features music from Season 2 of TTRH. 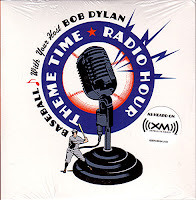 In November 2010, Ace released the third, and presumably last, of its TTRH compilations, Theme Time Radio Hour Season 3 with your host Bob Dylan. The 2-CD set is available for order through both Amazon U.S. and Amazon U.K.
Of all the commercial compilations, the Ace volumes of Theme Time Radio Hour with Your Host Bob Dylan best reflect the breadth of music played on TTRH. All contain both relatively modern music, such as The White Stripes Seven Nation Army, The Clash's Tommy Gun, and Nirvana's Frances Farmer Will Have Her Revenge on Seattle, as well as the type of vintage cuts you'll find on the other sets. Ace announced that it would release a box set collecting all three of its TTRH CD compilations in a packaged slipcase resembling a vintage radio, and for a short time advertised that set on both Amazon and Amazon U.K. for a $79.98 U.S. dollars price. However, as of this writing (November 2010), both the U.S and U.K Amazon pages have been changed to sell the slipcase only - although both note that it is out-of-stock. Adding to the confusion is the erroneous price listing and description on the Amazon U.S. page, noting a $64.84 discount and that what is being sold is "all three volumes of this acclaimed series based on Bob Dylan's 'Theme Time Radio Hour' radio show from Ace together in this limited edition cardboard box holder" Add it to your shopping cart if you like - I did - but I think it's highly unlikely that either you or I will eventually receive all three editions of the Ace compilations in a cardboard holder for $15.14. But hope springs eternal. For those wishing to buy the slipcase only, the current best bet seems to be through Ace itself. The 2008 Starbucks compilation, Artist's Choice - Bob Dylan: Music That Matters To Him is highly recommended. The CD set reflects Dylan's musical interests, "right now," as he relates in the liner notes, and the music in the compilation could easily have appeared on a TTRH playlist. The CD also has another connection to TTRH. Its liner notes state that it was produced by "Tim Ziegler," the fictitious name used by a caller during one of the Season 2 episodes who complained that Dylan had misidentified a record label. Christmas Party with Eddie G. is the only commercial release of one of TTRH writer/producer's Eddie Gorodetsky's infamous Christmas compilations. 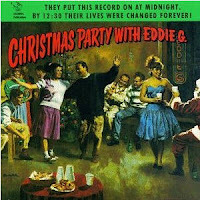 It's more Dr. Demento-oriented than a typical TTRH episode, and as its title implies, Christmas Party with Eddie G. is focused entirely on a holiday theme. The compilation is notable to those interested in the background and origins of TTRH. The original CD was the only release from Bob Dylan's Strikin' It Rich label, created in October of 19 and 90 with the stated goal of "releasing rare and interesting rhythm and blues material" and an early precursor of what would become the idea for TTRH. Prices for the CD, available through resellers on Amazon, verge on the ridiculous to the reasonable. Although overpriced, the CD/DVD set, Ricky Jay Plays Poker is also of interest to the TTRH fan. A friend of Bob Dylan and Eddie Gorodetsky (Eddie G. is one of the table members watching Jay demonstrate various card deceptions on the DVD feature), Jay's compilation could easily be a TTRH set with the theme of "Poker." The tracklist includes artists as diverse as Memphis Minnie, Anita O'Day, and Lorne Greene. Recommended for the TTRH completist. There are literally dozens "Roots of Bob Dylan" compilations, including at least one using that title, all collecting music that the curators claim had some influence on Bob Dylan. My personal favorite from a TTRH viewpoint is Songs from the Invisible Republic: The Music That Influenced Bob Dylan. Invisible Republic is a 2-CD set issued by a Repertoire Records, based out of Hamburg, Germany. The 45 cuts on the set include artists as diverse as Odetta, Slim Harpo, Bing Crosby, and Curtis Mayfield. The common thread tying all together... Bob Dylan. If you've read the various speculations and commentaries on the musical influences on the songs of "Love and Theft" and Modern Times, here's the means to listen to all their antecedents in one package: Gene Austin's The Lonesome Road; Slim Harpo's Shake Your Hips; Bing Crosby's Where the Blue of the Night (Meets the Gold of the Day) itself the theme song for Crosby's Philco radio show; Billie Holiday's Having Myself a Time; and more, including the hard-to-find Uncle John's Bongos by Johnny & Jack, which inspired probably the most nakedly transparent music appropriation Dylan has made to date: Tweedle Dee & Tweedle Dum. While hard-core Dylan fans may find nothing particularly new in Invisible Republic (for example, the roots of Modern Times were thoroughly covered by the excellent Live Roots and Wounded Flowers bootleg of 2006), the chances are that you'll hear at least one surprise. Of course, that's one of the delights of Theme Time, hearing music you've never heard before, and connecting it to other music. And it's one of the delights of Invisible Republic. If you want to listen to a Theme Time Radio Hour with the theme of "Roots," you couldn't do better for source material than Invisible Republic. After getting completely confused when looking at Amazon, this commentary sorts it all out, puts releases in their correct context and has made it far easier for me to understand what it is I could be buying. Thank you! I'm not a fan of Dylan's music at all - but his influences and picks are absolutely superb.